To manage a destination wedding in the Florida Keys, there are many moving pieces to oversee. 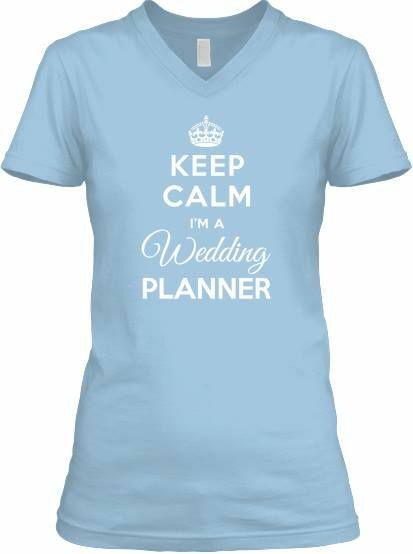 With the help of a professional wedding planner, the wedding planning process will be fun and exciting… not overwhelming and stressful. Remember: there’s no crying in wedding planning! Timing is everything, especially when you are planning a destination wedding in the Florida Keys, and if there are certain people that you specifically want to have in attendance, giving ample notice is not only necessary but also proper etiquette. Check with key family and friends before you finalize you wedding date so that they have plenty of time to make suitable arrangements. Feeling overwhelmed? Time to call your destination wedding planner. A professional wedding planner located in the area of your destination wedding will eliminate your stress and guide you through the wedding planning process in a time-efficient manner. They know the best vendors around and work within your budget. More often than not, a good wedding planner will make you aware of unnecessary hidden costs and have lots of money-saving ideas. Finally, don’t put your family and friends to work on your wedding day….let the professionals at D’Asigner Events do the work so everyone can sit back, relax and enjoy the wedding day. In order to manage expectations for your special day, you need to start by setting your wedding budget. Assess the amount you have set aside for the wedding (not including travel) and if there are members of your family who will be contributing, discuss their contribution with them well in advance. Use an Excel spreadsheet to keep an eye on those expenses and don’t allow a wedding planner to pay your vendors on your behalf, or if they do, insist on seeing a copy of the invoice issued directly from the vendor so you know where every penny of your money is going; D’Asigner Events provides a convenient pre-loaded spreadsheet for our clients to be sure nothing is overlooked. Choose a wedding location, including a venue for your ceremony, cocktail and wedding reception. Once this is complete, you can start getting a better idea of how your celebration will look feel in these spaces. D’Asigner Events provides full color CAD floor plans to clients and venues, so everyone understands the layout in advance. When it comes to the look and feel of your event, it’s time to decide your color scheme and theme that will make your destination wedding unique. Start seeking inspiration from stylebooks, wedding magazines, wedding websites, blogs which will help shape your wedding style preferences. Online boards like Pinterest are great tools to assist you in the initial stages of destination wedding planning. 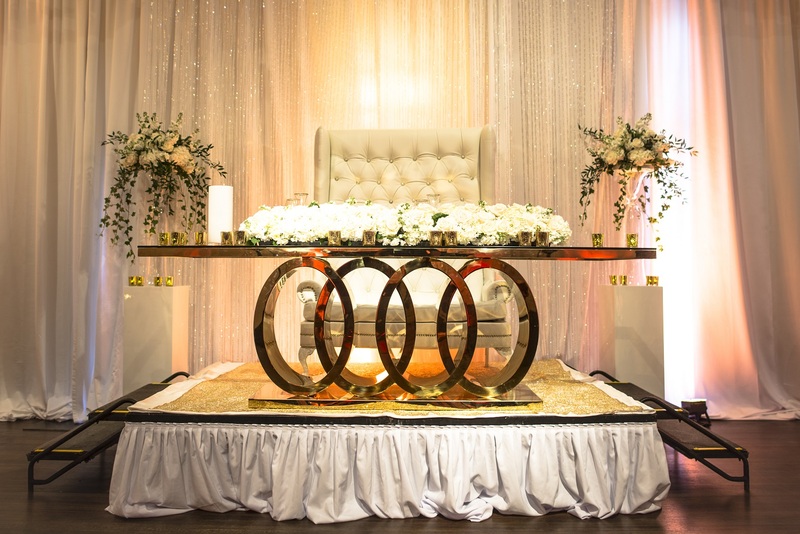 D’Asigner Events provides design consultations with a licensed Florida Interior Designer to ensure your wedding is uniquely styled to your specifications. Select your attendants, start thinking about their attire and communicate your expectations before-hand. Now is a great time to create a separate spreadsheet to manage your guest list. Keep track of your guests RSVP’s, meal choices/allergies (a requirement of most venues) age category (under 21, under 12, baby) hotel locations, rehearsal party reservations, and anything else of importance pertaining to your particular wedding. Be sure to add a “gift given” and “thank-you” note column! Go dress shopping, make appointments at local wedding dress boutiques or star pursuing online bridal stores to get ideas of what shapes and styles you love. Then, once you’ve said “yes” to the dress, think about what accessories you may want. Make sure you have valid travel documents and photo ID and meet all legal requirements to obtain a marriage license in the state of Florida. If you are having a religious wedding, book your officiant now, and make sure all requirements are met for your particular type of ceremony. Photos and videos hold the most precious memories of your big day. That is why these vendors are your most prized vendors. If you are bringing own photographer from your hometown, confirm that your wedding venue will allow “outside vendors” and what the liability insurance requirements are or, find out about the photography options in your chosen location. NOTE: We know you love the photographer from your home town, but trust us…we know the best, award winning photographers in the area who know where the premium photo opts are, and best of all, they don’t require an airline ticket and hotel expenses. Start a Photo List with all the photos you want your photographer to capture and be sure to share this info with the photographer and videographer if using both. Remember, your photographer won’t know your wants and dislikes unless you tell them. The next most important vendor is your DJ or Band. Choosing this vendor is critical in the success of entertaining your guests…especially the dancing/party crowd. Naturally, the best DJ’s and bands are booked immediately so selecting this vendor well in advance is a must. Reputable entertainers will provide you with an online worksheet to develop your own Playlist with your favorite tunes as well as the “do-not-play” list…..equally important! Your wedding band are symbol of your commitment on one another. Choose rings that will reflect your personalities but will also have longevity in terms of style and durability. About 8-10 months in advance of your special day, you will want to send out save-the-date cards to give guests plenty of time to make travel arrangements. Also include local hotel lodging information and websites. Be sure to book a block of rooms at your venue and perhaps one other hotel in an alternate price range so you guests can have a choice. If your budget allows, plan a weekend to visit your wedding planner, tour the venue, schedule a taste testing, visit the florist and rental companies and don’t forget the hair and make-up trial! Food will be a very important part of your day and something that will take careful consideration, especially since you’ll want to consider the various food preferences and allowance of your guests. A trip to your venue for a taste testing will allow you to narrow down menu selections for the reception, cocktail reception etc. It’s also a good time to determine your bar selections for all events. Will you be asking the venue to prepare a signature drink for your special day? All these things need to be considered and communicated at this time with your venue coordinator. Are you planning a rehearsal dinner for the immediate wedding party or all out-of-town guests? This is the time to decide where and when this will happen. Taste-testings are usually not necessary for this event, but you can certainly opt to do so if need be. Save your wedding date with your chosen florist. A personal visit to the florist is always highly recommended with your D’Asigner Events wedding planner/designer so your personal style, décor theme remains cohesive, but if this is not do-able, a conference-call phone consultation with the florist and your wedding designer will work. Often, your floral quote will not be confirmed until 1 or 2 months from your wedding date based on your specific floral choices. Weather conditions effect the growing cycles of particular flowers, so prices may fluctuate. NOTE: Have a conversation with your florist about what to do with your flowers after the festivities are over: Do you want to keep them? All of them? A portion of them? None of them? Donate them? Remember also, that unless purchased in advance, the floral containers and vases need to be returned to the florist. A reputable florist will pick up all flowers and containers immediately after your reception has ended, so they will need to know your wishes in advance. Selecting your wedding cake, and flavors, style, icing and décor is next on the list. Your wedding planner will provide you with a list of flavors to choose from and arrange the cake testing. Bring plenty of photos of cake ideas so together, the bakery and D’Asigner Events can help you design the perfect wedding cake for your wedding theme and personal design atheistic. Stationery is a big part of your décor, tying together your wedding theme, decor and color story consistently from Save-the-dates to invitations to thank-you notes. When choosing your stationery for your destination wedding, there is much to choose from: menus, place cards, seating chart, wedding programs, signage, table numbers, seating charts, maps, welcome letters…the list goes on. Your D’Asigner Events destination wedding planner will help you narrow down what is best for your needs. The Florida Keys is limited in our inventory of limousines, trolleys and shuttles. Be sure to book your transportation early or expect big added expenses for bringing in such transportation from Miami. Now is the time to research and order in items that you will want for your welcome bags. It is best to order items online if possible and have them shipped to your destination wedding area. D’Asigner Events is happy to receive your shipments and store them in an air-conditioned area until you arrive into town at no additional cost. Are best sent out within this timeframe. Choose an RSVP date around the 30-day mark. Make the RSVP date easy to remember, like the 1st day, 15th or the last day of the month…guests will tend to remember the deadline day much easier than a random date. Be sure to include your #hashtag and wedding website information if you are a techie couple. Etiquette Warning: adding information about your wedding gift registry on your wedding invitation is a no-no; this should be reserved for your wedding website or bridal shower invitations. If you have time and patience…here is where you keep your techie guests updated about all things related to your destination wedding schedule such as reminders for ceremony and reception times, address of wedding venue, dress attire recommendations, hotel recommendation links, Chamber of Commerce links etc. This is also where you can post information about your wedding gift registry with a direct link to the website. NOTE: we at D’Asigner Events have noted from our hundreds of couples, that wedding websites are mildly successful with informing guests. Be sure to have a hard-copy paper version of your wedding itinerary for those who skipped the wedding website. 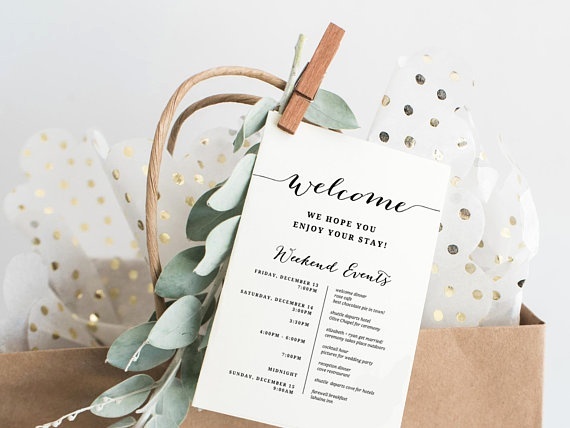 This can be issued to guests in the form of a paper stationery insert in your wedding invitation or a “welcome letter” format placed inside a Welcome Bag. Not doing Welcome Bags?...most reputable hotels will be happy to take copies of your Welcome Letter at the front desk and issue them to your guests upon arrival at no charge. Each vendor will reach out to you at this time to finalize any details and arrange final payments. Be sure all fittings are completed. 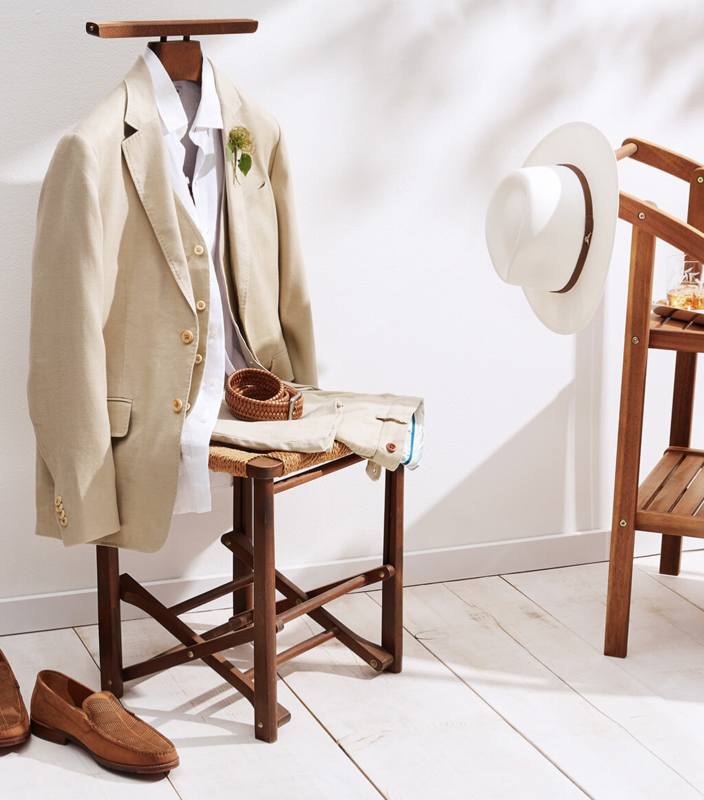 NOTE: If traveling by air, pack your wedding attire in carry-on luggage for obvious reasons…a lost wedding dress = a melt-down. Check with your airline about wedding dress carry-on rules. Other options: UPS or FEDEX your wedding dress with a tracking number directly to your wedding planner in plenty of advance. We at D’Asigner Events will gladly accept your wedding dress via these delivery services. We will also unpack and hang your dress immediately upon receipt, so you will not face a wrinkled mess when you arrive. Professional steaming in the Florida Keys can be arranged if need be. Write your vows. You might think you can do it while you’re lying on the beach a day or two in advance…wrong! You’ll be too busy. Writing them beforehand and it will be much less stressful. Make a copy and email it to yourself. Your venue will require final counts anywhere between 3-7 days in advance. After this date, you cannot decrease the guest count, but you can increase it a bit…by a certain percentage…based on your venue. The day before the wedding is the most popular time to arrange this event. However, some venues may have events scheduled in your chosen location thereby preventing you from actually walking through the motions. Be sure to book the space well in advance to avoid this or choose an alternate time or day for the rehearsal. NOTE: Don’t skip the ceremony rehearsal. As simple as it may seem, not knowing what to do or where to stand, or what to expect will only add confusion and anxiety to your wedding day. Stop by the nearest Clerk of Courts, with your significant other and pick up your marriage license. Be sure to have all up-to-date necessary ID with you including proof of any prior marriages that have been dissolved. If either of you are residents of Florida, there is a 3-day waiting period you must observe before the actual wedding date. Give your marriage license directly to your officiant as they are solely responsible for filing all paperwork with the State of Florida. If you are planning to give tips to your vendors who have gone above and beyond to help you get to this point, place money into envelopes and designate a trustworthy person, or your Wedding Planner to disburse these for you the day of the wedding. Appoint a trustworthy person to be in charge of collecting your wedding gifts, envelopes and objects of value during the wedding day. Your Wedding Planner and venue will not be responsible for any lost or misplaced items.